Heavy rainfall, floods and tornadoes have devastated southern-central US, killing several people, washing away houses and forcing thousands to flee. Rivers rose so fast that entire communities woke on Sunday surrounded by water. At least one person was killed in Texas – a man, whose body was recovered from a flooded area along the Blanco River, the authorities said, adding that the river rose 7.9 meters (26ft) in just one hour. About 1,200 residents in Hays County are now homeless after the Blanco River flooding. From 350 to 400 homes were destroyed in a small town of Wimberley. Many of them were washed away, according to emergency management coordinator Kharley Smith from Hays County. At least three people are still unaccounted for. The town of San Marcos saw about 300 damaged homes, she added. "[My husband] told me there was 2 inches of mud," Tami Mallow, 41, from San Marcos told AP. "I don't know what the cleanup process is going to be." About 1,000 people were evacuated in central Texas. Also Montgomery County Office of Emergency Management forced another 1,000 people to evacuate due to heavy rainfalls. In Hays County people were rescued from rooftops, officials said. "Never in our wildest imagining did we think about the wall of water that would some so quickly or cause so much destruction," Judge Bert Cobb of Hays County told a morning news conference. An apartment complex in Houston, Texas was heavily damaged by a tornado which also toppled trees and blew out windows. At least two people were taken to the hospital. At least two people have been killed in Oklahoma, the state’s Department of Emergency Management said. A firefighter, Captain Jason Farley, was trying to rescue people from high water, but was swept into a drainage ditch. A woman in the city of Tulsa was killed in a traffic-related accident. This May is the wettest month for several places in the Southern Plains states. Oklahoma City saw 27.37 inches (70cm) of rain this month. Last year it got only 4.29 inches. "It looks like the rainfall that we're getting now may actually officially end the drought," that has struck the Southern Plains states for years, said Meteorologist Forrest Mitchell at National Weather Service office in Norman, Oklahoma. 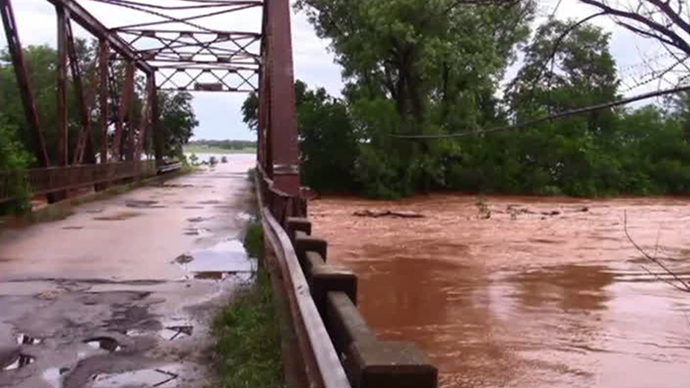 The meteorologists issued flash flood watches for Arkansas, Missouri and Kansas, while tornado warnings were issued for Illinois, Iowa, Kansas and Missouri.